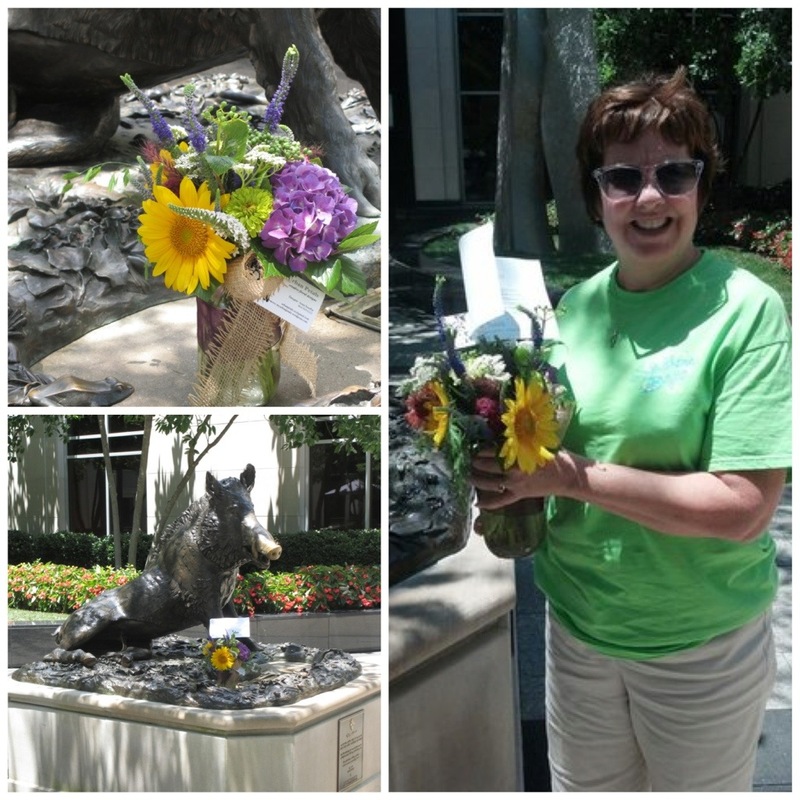 I took part in the (inter)National Lonely Bouquet Day on June 30, 2013. 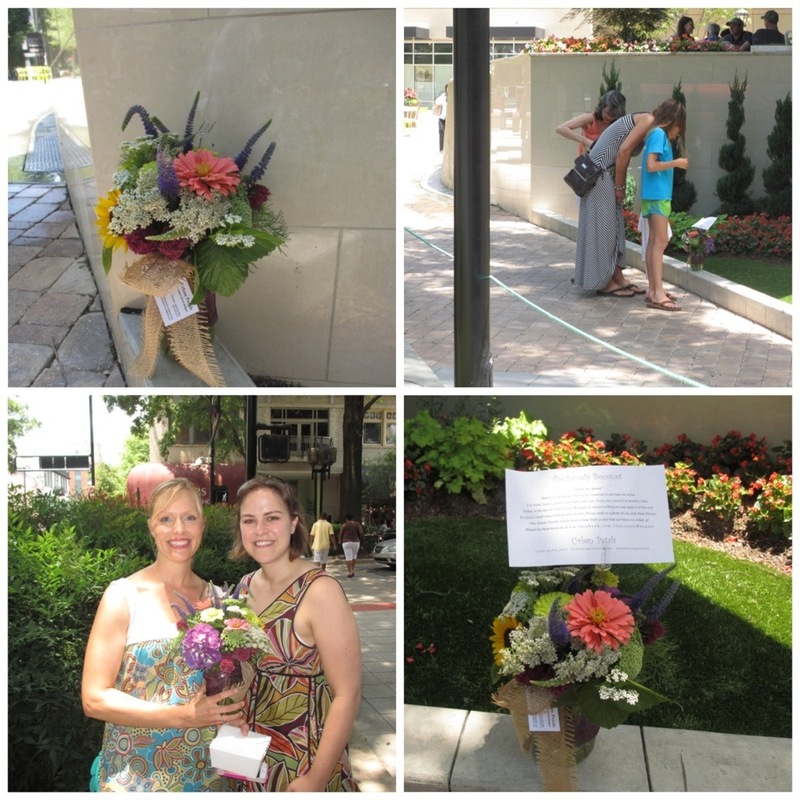 The movement was started by Emily who lives in Belgium as a way of spreading joy through the gift of flowers. I have really enjoyed reading some of Emily’s blog as she explains more about this amazing idea and the journeys that her “lonely bouquets” have taken. You can find her blog, Fleuropean, here. I’m fresh from a garden and made with care, Enjoy me yourself or possibly share. It’s just a small token and gesture of ours, Please send us a photo of you with these flowers. This was such a rewarding way to spend a Saturday. Although I have to admit, I had a hard time letting go of the flowers and I couldn’t just leave the bouquets sitting there. So I stuck close by and watched to see who found the bouquets. A lot of people stopped to look and read the note and take pictures. I also saw lots of people smile and comment on how much they loved the idea (yeah, I was sitting that close …trying to be all incognito…HA!). I had one girl tell me (after she found the bouquet) that she was nervous to take the flowers because she felt like she was stealing. 🙂 I watched as a few people picked the flowers up, checked underneath the vase and looked all around to make sure there wasn’t a hidden camera, and then they put the flowers down and walked away!! It was quite humorous. This project reminded me that I don’t need a reason to display a random act of kindness. I can leave flowers on someone’s doorstep, pay for somebody’s coffee, or make a meal for a friend (and they don’t even have to be sick!). 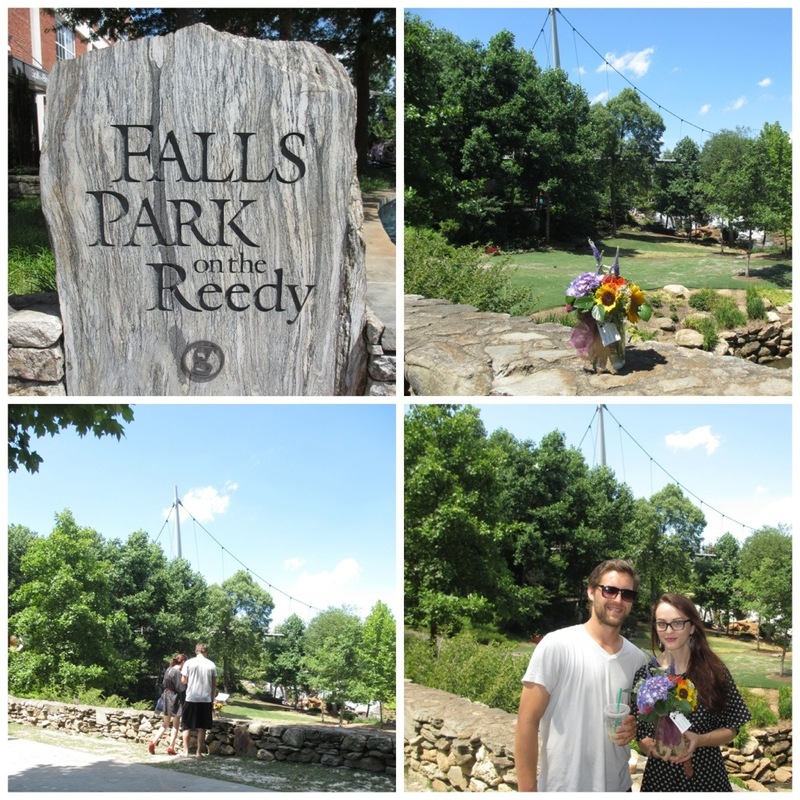 I had so much fun giving away flowers and just watching the joy on people’s faces as they found the flowers!! 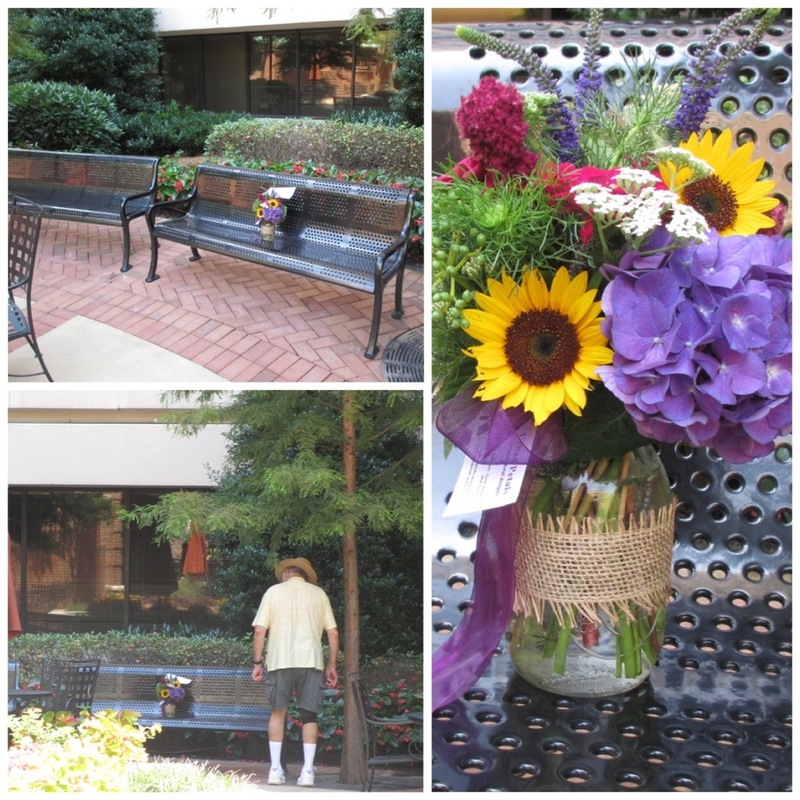 Watch out, you just might see more lonely bouquets popping up around Greenville. Here are my Lonely Bouquets and their stories. I left Bouquet #1 in a pretty courtyard behind my husband’s coffee shop. I waited and waited and finally this sweet older couple sat down near by. The husband walked over and read the note and then told his wife to go ready the note. I could hear them talking about how neat it was but nevertheless, they left bouquet sitting there. Bummer! After a while, I decided it was time to move on so I left it sitting there. Just a few mintutes later, I got a message on my Urban Petals facebook page saying, “Thanks for the flowers!” Somebody found the lonely bouquet!! The location of bouquet #3 cracked me up! There is this HUGE bronze statute of a pig in downtown Greenville. It’s actually a water fountain but the water comes out of the pigs mouth so it looks like it’s drooling. I don’t know why it cracked me up but it did! I forgot to mention that throughout the day, I left clues on Urban Petals’ facebook page as to the locations of the bouquets. This bouquet’s clue was, “Lonely Bouquet #3 kept Porky company but not for long”…” This nice lady claimed quickly claimed the bouquet! 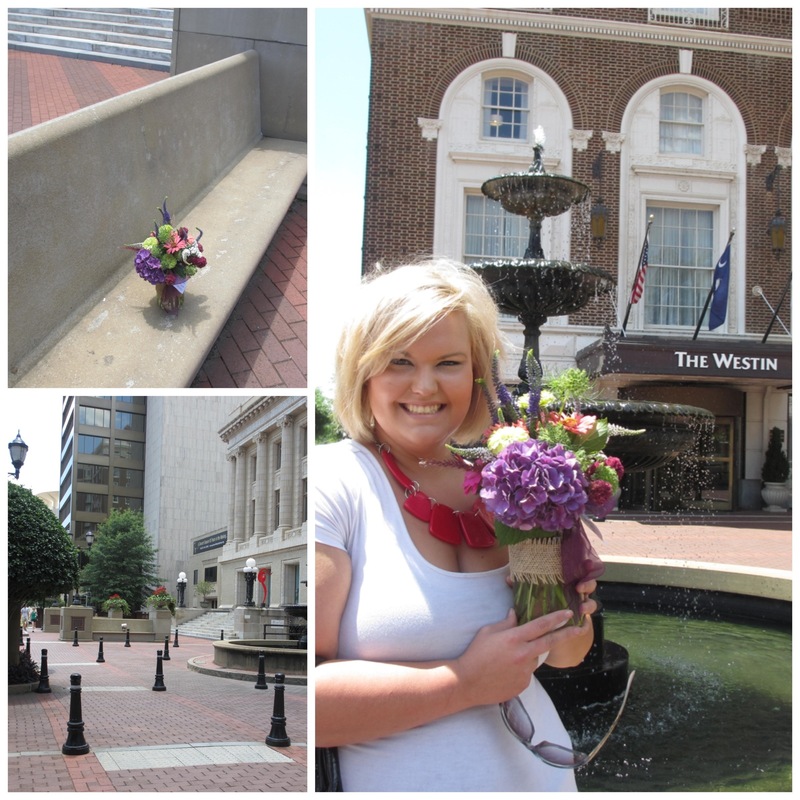 She also put Urban Petals and Greenville, South Carolina on the Lonely Bouquet world map by submitting her picture!!! Check th world map out here. It’s pretty amazing to see bouquets from literally around the world. Lonely Bouquet #4 was left on a bench near the Westin Poinsett hotel which is also close to City Hallso there was plenty of foot traffic and therefore lots of lookers as you can see from the pictures above. Since it was such a hot day, I felt bad about leaving this pretty little thing in the hot sun but thankfully this lovely lady came running down the street to claim it!! She had been following my clues on Facebook throughout the day and was determined to adopt a lonely bouquet. I’m so glad she did!!! Last but not least, I set lonely bouquet #5 on the stone bridge in Falls Park where it could enjoy the lovely view of the waterfall and bridge. But these nice two people came along and adopted it quicker than you can snap your fingers. I’m so glad they did! I hope this will encourage you to go out and share a random act of kindness with someone else this week. My fellow Chapel Designers sure had a blast with the Lonely Bouquet and below are links to some of their blogs where you can read about their adventures and lonely bouquets.